"The RLI programme has been a very beneficial program for us to follow with one of our pupils in school. She has gone from having no interest in reading words only looking at pictures to reading shorter stories well and with enjoyment." This article reviews the incidence of sleep problems in children with Down syndrome and introduces readers to the link between behavioral problems and the quality of children's sleep. Practical suggestions about how parents can improve the bedtime routine and their responses to night-time awakenings are provided. The article concludes with a brief review of evidence that supports the use of behavior management in order to decrease learnt sleep problems. The final page provides photocopiable resources to help parents to chart each stage of the process of overcoming unacceptable bedtime behaviors and sleep problems. This article reviews the incidence of sleep problems in children with Down syndrome and introduces readers to the link between behavioral problems and the quality of children's sleep. Practical suggestions about how parents can improve the bedtime routine and their responses to night-time awakenings are provided. The article concludes with a brief review of evidence that supports the use of behavior management in order to decrease learnt sleep problems. The final page provides photocopiable resources to help parents to chart each stage of the process of overcoming unacceptable bedtime behaviors and sleep problems (see pdf version). Studies of sleep disturbance in children with Down syndrome, by Rebecca Stores and colleagues, have reported a high incidence of sleep problems in children with Down syndrome. [1-3] There are two main underlying causes of sleep problems, namely physical or breathing-related sleep problems, which are particularly common in children with Down syndrome when compared with children with other types of learning disability, and behavioral sleep problems, which can be successfully managed using behavior modification techniques. The figures in Table 1 indicate how common night-time problems are among children with Down syndrome. In the group of 7-11 year olds, four children in ten have difficulties in settling at bedtime, and half of the children still wake at night. By the late teenage years, the figures illustrate considerable improvement but one or two teenagers in ten still have settling or night waking difficulties. children with similar levels of learning disability but not Down syndrome. The data indicated that the two groups of children with disabilities had significantly more sleep problems in comparison with the groups of typically developing children. There were no significant differences in the sleep patterns of the siblings of children with Down syndrome and the children from families without a child with a disability. This indicates that the families of children with Down syndrome had no more difficulties with their other children than other families. The figures in Table 2 show the comparison between the sleep difficulties of the children with Down syndrome and the typically developing age-matched comparison group. The figures illustrate that the sleep disturbances of children with Down syndrome fall into two main categories, which the researchers describe as 'physical' and 'behavioral' problems. There was a tendency for the children with learning disabilities, other than Down syndrome, to show more behavioral sleep problems such as difficulties with the bedtime routine, sleeping alone, early waking and night waking but less physical or breathing-related sleep disturbances than the children with Down syndrome. Children with Down syndrome are particularly vulnerable to sleep apnoea, that is, disordered breathing during sleep. They may be heard to snore, cough, choke and exhibit signs of restlessness, unusual sleeping positions, excessive sweating and periods when breathing is observed to stop. A typical apnoeic episode is when a child stops breathing altogether for a short period of time and then suddenly resumes breathing with rapid gulping for air. Apnoeic episodes may not affect the amount of time spent sleeping; however, they may affect the quality of sleep. One of the important consequences of sleep apnoea is that it results in a periodic reduction in the amount of oxygen carried in the blood and this may have a deleterious effect on health and development. There are two main types of sleep apnoea: obstructive sleep apnoea and central sleep apnoea. Obstructive sleep apnoea is much the commonest form of sleep apnoea and is characterised by partial obstruction of the upper airways, which tend to be smaller in children with Down syndrome, for example by enlarged tonsils and/or adenoids. The cause of the obstruction is usually treated through surgery and this tends to be very successful. Central sleep apnoea is a much more rare condition and is caused by neurological disorders of breathing control. The cause of the problem in these cases is much harder to treat; however, the symptoms may be alleviated if the child wears an oxygen mask at night. Parents who have observed symptoms suggesting sleep apnoea should ask to have their child referred to a sleep laboratory where a detailed diagnosis can be made. It may be helpful to explain to the family doctor that apnoea is particularly common in children with Down syndrome, as health professionals often have little awareness of sleep disorders and this condition is generally under-diagnosed in the general population. sleep maintenance difficulties: night waking problems, waking and getting up earlier than the family's accepted rising time. These problems generally occur when the child has not had the opportunity to learn a more acceptable sleep pattern. Generally, where patterns of behavior have been learnt, they can be unlearnt and replaced with new behaviors. Research by Rebecca Stores and colleagues indicates a link between sleep disturbance, the occurrence of daytime behavior difficulties and the children's mothers' stress levels. [1-3] Sleep can be disrupted for a number of reasons as outlined above. However, the effects on children's daytime behavior are similar; they may show signs of irritability, aggression and hyperactivity. In addition, if the quality of children's sleep is disrupted it may well affect their concentration span, and therefore their ability to learn. The research indicated that children with sleep maintenance problems had significantly worse daytime behavior ratings and their mothers had higher stress levels than the children with sleep onset problems or breathing-related sleep disturbance. Night waking seems, then, to have the most serious consequences for the child and the family. These facts indicate that, for a child with Down syndrome who is exhibiting daytime behavioral problems, it is of utmost importance to assess the quality and quantity of his or her sleep, as a program designed to improve the child's sleep may also have the effect of improving his or her daytime behavior too. It should also be noted that sleep difficulties can be very stressful for the whole family and may lead to interference with the parent-child interaction, maternal malaise, sleep, fatigue and stress, marital discord and even abuse. [7, p.581] Parents who are stressed and sleep-deprived themselves, as a result of tending to a child with sleep difficulties, may find it difficult to implement consistent and appropriate behavior management strategies in the daytime. Treating sleep disturbance is of the greatest importance to ensure good quality of life for parents and children alike. Behavioural sleep problems will respond to behavior modification techniques. The following section deals with some of the behavior issues involved and it outlines some specific techniques that have been employed to manage behavioral sleep difficulties. The first step in addressing any sleep problem is to keep a sleep diary (see p.126 for photocopiable example), recording the antecedents (details of the physical and social environment that may trigger the problem), the target behaviors themselves, (exactly what happens and how often) and finally, the consequences (what happens immediately after the target behavior). This will help with identifying unintentional reinforcement and act as a baseline with which to compare behavior after the implementation of the behavior management program. Before examining these principles, it is important to note that painful physical conditions, such as otitis media, can be the underlying cause of reluctance to settle and/or frequent night awakenings. In a child who does not have an additional behavioral sleep problem, the disturbance should subside once the child's physical ailment has been treated and he or she has recovered from the temporary period of illness. Secondly, children's sleep may be affected by emotional instability. In this case, the priority should be to identify the cause of the child's anxiety and treat this. Children need to be clear about the activities that happen in the morning, in the day, in the evening and at night. They need to be woken in the morning and put to bed at night at the same time every day and this needs to be kept as constant as possible at weekends and during holidays. Parents need to decide on a routine set of activities that should happen before bedtime, lasting no more than about half an hour and stick to these activities in the same order, at the same time and for the same duration every evening. It is vital that both parents agree on the bedtime routine so that they are consistent in the way that they manage bedtime. Children with Down syndrome will be helped to understand the routine if they are given visual prompts, such as an egg-timer to time their last game or story, photographs or picture cards of each stage of the routine that they can put in the correct order, or home-made picture books about the bedtime routine in their family. Infants and children need to learn that feeding happens in the day and not at night from as young an age as possible. Parents should seek advice from their health visitor or family doctor about how many hours they can expect their baby with Down syndrome to sleep without a feed, as this will depend on the baby's health and weight. Once you have decided that the baby should sleep for more than approximately four hours in a night, bottles should not be given to pacify the baby who wakes in the night since this actually reinforces night waking. Sometimes a small feed just before the parents are ready to go to bed may help the baby to sleep for longer, before waking for a feed. Parents of older children should restrict cola and chocolate and other caffeine-rich foods or drinks in the hours before bedtime. As a rule, children should go to bed when they are tired, so that they fall asleep soon after they have been put to bed. This will help the child to make an association between the bedroom and activities such as brushing their teeth and changing into their pyjamas and feeling sleepy. Children requiring an afternoon nap should have this earlier rather than later to ensure that they are tired again by bedtime. Although it is important for the child to go to bed when they are tired, this does not mean that the bedtime routine should be disrupted just because the child does not seem to be tired. It is imperative that if the family have decided that a child's bedtime should be seven o'clock, then they should go to their bedroom at seven o'clock every night. Parents should be wary of playing active games before bedtime in an attempt to make the children feel tired and ready to sleep. Physical 'rough and tumble' play or games such as chase can get out of hand before bedtime and may create a noisy, boisterous atmosphere that does not lead to feelings of relaxation and readiness for sleep. Also, if behavior becomes out of control a tired parent may react negatively to the child by shouting and sending them to their room. If the child goes to bed angry, confused and/or tearful, then it is these feelings that will becomes associated with the bedroom, with the effect of increasing any existing behavioral sleep problems. This said, a degree of controlled physical exertion such as a ball game may help some children rid themselves of excess energy in readiness for bed. All behaviors take place within a physical and social environment and it is vital to consider the role that the environment plays in how behavior is learnt. Firstly, let us consider the physical environment of the child's bedroom where the desired behaviors will take place. The room should be safe and secure. It should neither be too warm, nor too cold, and as quiet and as dark as possible. Many children refuse to go to bed with the light off, but it is important that the room is darkened as the onset of sleep is affected by the natural cycle of light and dark and artificial light can disrupt the sleep/wake cycle. However, commercially available nightlights do not disturb sleep. The room should be tidy and free from stimulating toys that might encourage the child to get out of bed and play. It should also be safe so that if the child's behavior deteriorates and the behavior program dictates that the child must stay in their room, he or she will not come to any harm. As children with Down syndrome are usually restless sleepers, it is worth putting them into sleeping suits to ensure that they stay warm enough if they become uncovered at night. A child who is cold is likely to wake. The family need to create a relaxing environment with positive connotations so that the child feels emotionally safe when they are in their room on their own. It is vital to create a positive atmosphere at bedtime, so that the child looks forward to preparing for bed, rather than feeling that they are missing out on important playtime or missing opportunities for attention and play with other family members. A safe and reassuring environment can be created through playing soft music, cuddling, talking quietly and reading stories. The child needs to associate the bedroom with peacefulness and security and therefore this room should not be used for active play. In addition, the bedroom should not be used for punishment, otherwise the child may associate the room with negative emotions such as anger and resentment. Many parents will get the child ready for bed long before the agreed bedtime in the hope that this will minimize bedtime confrontations. This is not helpful to the child, as they need to learn to associate each stage of the routine with the final stage, 'falling asleep'. If the child prolongs the bedtime routine, by getting up and coming down stairs again, making numerous 'curtain calls', as France and colleagues put it, the child will not make the connection between the bedtime ritual and actually falling asleep, as he/she will have responded to so many other stimuli in between. Therefore, the preparation for sleep, which might include bath-time, nappy changing or using the toilet, changing into nightclothes, quietly reading or talking and saying goodnight, needs to be predictable. Children need to learn each step of the sequence and be reinforced or rewarded, when they show good bedtime behavior. The term 'reinforcer' means anything that is presented after a behavior and has the effect of making that behavior more likely in the future. Therefore, it is important to find suitable reinforcers so that each time the child displays a desirable behavior, parents can reinforce this. Children are all unique and, therefore, will each be reinforced or rewarded with different things. Praise and affection may be rewarding to one child, while 'Smarties' or playing a music tape may work for another. Many children with Down syndrome find social rewards such as praise, verbal interaction, eye contact, cuddling and singing rewarding but there are some children with Down syndrome who do not. Parents of the latter group need to experiment and be more creative in finding rewards that work for their children, for example stickers of favourite TV programs or cereal packet freebies. Once a suitable reward has been discovered, this can be used to reward good bedtime behavior. When you give rewards you need to use positive language and identify the behavior that is being rewarded, e.g. "well done, you went straight upstairs when it was seven o'clock". 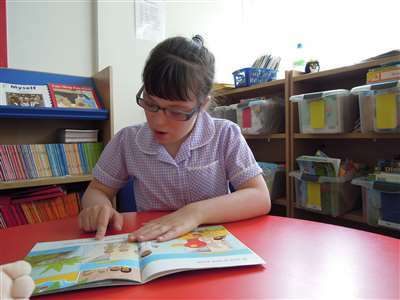 Children with Down syndrome have a specific language delay; therefore it may be helpful to use visual aids in order for the child to 'see what you mean'. You could use a star chart with pictures of the desirable behaviors, e.g. a clock face showing bedtime or a photo of the child asleep in bed with a space next to it for the stars. Children should always be reassured that if they did not meet the criteria for a reward 'this time', they can still get rewards at another time. Keep regular 'bedtimes' including weekends and holidays where possible. Make sure the child knows that they should not disturb other members of their family until after an acceptable time. Do not give food or bottles during the night to get a child to go back to sleep unless they still require night feeds due to their age, size or health. Do not put children to bed while they are still hungry (giving babies a feed before the parents retire can encourage them to sleep for longer without needing a feed). Do not allow cola, chocolate or other caffeine rich foods or drinks before bedtime. If a child requires an afternoon nap, schedule it for the early afternoon as opposed to late afternoon. Avoid stimulating activities in the hour before bedtime. Make sure the child's room is quiet, dark and maintained at a comfortable temperature, neither too warm nor too cold; it may be useful to ensure that the air is not too dry. Create an atmosphere that is relaxing, that makes the child feel safe and secure; the bedroom should not be used for lively, stimulating activities and play, at least not in the hours before bedtime. Attempts should be made not to create associations between bedtime, the bedroom and negative emotions, e.g. the bedroom should not be used for punishment. Do not prolong the bedtime routine; the child needs to associate the start of the routine with the final stage, the feeling of being about to fall asleep. Reward good bedtime behavior using a star-chart or another form of reward system. Do not reinforce settling and waking problems by giving into demands for drinks, food, stories and so on in an attempt to avoid confrontation. Requests to go to the toilet should be allowed, within reason, but verbal interaction and eye contact should be kept to a minimum. Sleep onset problems include reluctance to go to bed, inability to settle without a parent's presence and insisting on sleeping with another family member. Settling problems generally occur when the child has failed to learn how to fall asleep without an adult in the room with them. Many children do not sleep all the way through the night but a child can be said to have a sleep maintenance problem if he or she wakes in the night and is not able to resettle him or herself without a parent's presence. These problems often arise when the child has associated the attention given by parents with the onset of sleep and has not learnt that he or she can fall asleep on his or her own. Children with sleep onset and sleep maintenance problems often present a range of avoidance behaviors such as asking for the toilet, food, drinks or stories in order to keep their parents with them longer. This is rewarding in two ways. Firstly, the additional attention is rewarding in itself, and secondly, it prevents them from experiencing the thing they dislike the most, being left on their own in their bedroom. In addition, they may shout and cry constantly until the parent comes to their room. If they are mobile, they may find their way downstairs or into the parents' bedroom to seek comfort and attention. Many parents fall into a 'behavioral trap' by giving in to the child's demands, e.g. letting them fall asleep downstairs with the rest of the family, or in the parents' own bed with them. Parents of children with settling problems learn to anticipate confrontation at bedtime, responding with agitation and trepidation as soon as bedtime approaches. They reinforce undesirable behaviors by giving in to their child's demands, as they have learnt that this will help them to avoid confrontation and leads to peace and quiet in the short term. The more times the child experiences this sequence of events (wake, cry, comfort, sleep), the more resistant the behavior will be to change. However, any learnt behavior can be unlearnt under the correct circumstances and parents should always remember this. With commitment and support from friends, family and professionals, parents can change their children's behavior. Behavioural sleep problems can be solved by combining good sleep hygiene and a clear bedtime routine with the behavioral principles of extinction of undesirable behaviors and positive reinforcement of desirable behaviors. Extinction occurs when the link between behavior and consequence is broken and the child 'unlearns' the behavior. Keeping a sleep diary, listing antecedent, behaviors and consequences, will help the family to analyse what the reinforcers might be. This will help them to realise the effect of their own behavior on the child and help them to realise that they are also in a position to elicit desirable behavior from them. The next step is to decide exactly what they would like the bedtime routine to consist of, e.g. exact bedtimes, length of time to be spent with the child and so on. Parents also need to decide exactly what role they will play in the bedtime routine, remembering that the way they respond to the child will determine whether or not behaviors become more or less likely in the future. The decisions made at this point will form the behavioral management plan and will depend on what the parents find acceptable, realistic and practical. Whatever the plan consists of, it should be agreed between both parents, as it is imperative to the success of the program that all family members adhere to the agreement. Also, a professional in the field of behavior management should support families wherever possible. Parents then need to decide when to start the program. It is best to start the new program as soon as possible. Starting before a break of a few days such as weekend will minimize the effects of any initial sleepless nights on the parents' working lives. Other people living in the same house or even next door will need to be informed of the proposed plan and asked for their patience and cooperation, as the child may cry for longer than usual. The parents will also need to plan how they will respond to reluctant relatives, who may have their own ideas about the usefulness of the program, remembering that keeping extended family onside will be beneficial in the long run. They also need to consider what they will do if the child is genuinely ill and requires additional comfort and attention. In order to extinguish undesirable behaviors that occur when a child has not learnt to settle or re-settle by him or herself, parents need to ensure that they do not inadvertently reward the child with social rewards such as attention, social interaction or displays of emotion or with material rewards such as TV, drinks or snacks. These things act as rewards when they are given immediately after the target behavior. When the child cries out in the night, parents should consistently ignore the cries and give the child a chance to settle him or herself without an adult present. The age of the child will affect this firm strategy as a child still in a cot can be left to cry, while a child in a bed is likely to get out. Every time the child gets out of bed, comes down stairs or into the parents' room, he or she must be returned to bed, with no display of emotion and without verbal interaction or eye contact. Any attention that the child does receive must be limited to the activity being undertaken such as giving a feed, changing a nappy or taking the child to the toilet. The atmosphere should remain still and quiet and lighting should be as dim as possible. For a child in a cot, the strict version is to simply leave them to cry until they fall asleep, and the time spent crying should reduce each night. This can work quite quickly - e.g child cries for 90 minutes on the first night, 30 minutes on the second night, 10 minutes on the third night and thereafter settles without crying. However, many parents find this hard to do, so controlled ignoring or controlled crying is a plan they may prefer - see next page. Parents may also wish to consider training the older child to carry out a different behavior when they wake up rather than crying and shouting or coming to look for them. The replacement behavior should be something that the child can do independently that will help them relax, e.g. older children could be taught to count stars or smiley face stickers stuck onto their ceiling, or to press the 'play' button in order to listen to a short audio-tape of soothing music or a story, that will turn itself off when it has finished. It is vital that these new behaviors are rewarded whenever they lead to the child managing to resettle him or herself, without adult intervention. Slowly the child will learn to associate the new behavior with the onset of sleep. 1. Keep a 'sleep diary' [see p.126] as this will help you to produce your behavior modification program and it will allow you to see how well the plan is working. 2. Decide on an exact bedtime routine, that is acceptable to both parents, based on the principles of good sleep hygiene, (see Box 1). 3. Decide on a course of action that is acceptable to both parents, e.g. systematic ignoring, controlled ignoring with 5 minute checking, systematic ignoring with parental presence. They both need to feel that they can be committed and consistent in their approach. 4. Be warned: breaking the program can sabotage any good effects that have been achieved and repeated failed efforts can lead to problems that can become resistant to change; both parents must be committed to the existing program. 5. Start the program at a time that is convenient to both parents, when there are as few other stressors impacting on family life as possible. 6. Inform other people living in the same house and neighbors, of the introduction of the behavior management program because the initial stages of most programs are often associated with increased disturbance. 7. Decide what action will be taken if the child is ill, i.e. whether to stop the program or not; if the program is stopped, it is essential to resume the program as soon as possible. 8. Practise how you will explain your decisions to reluctant friends or relatives who may disagree with your chosen course of action. 9. Regularly monitor the quality and quantity of desirable and undesirable behaviors presented by the child, in order to measure the success of the plan; remember behavior is likely to become 'worse before it gets better'. This is called the post extinction response burst. Once the behavior program has been implemented, it is vital to monitor its effectiveness by keeping records. Counting the number or duration of undesirable behaviors and charting progress each night, will help parents to see whether improvements have been made, no matter how small. It is important to realise that consistent application of the program will work but it is not possible to predict how long it might take. Parents often wonder how long they should continue to proceed with a behavior plan before modifying their approach. This, too, is an impossible question to answer, as some behaviors can take a very long time to extinguish, but will diminish if the program is rigidly adhered to. One thing that should be remembered is that behavior will not change and may in fact increase, if the parents and others involved with the child do not apply the program rigorously. Therefore, it may be important to modify the program when the family feel that they can no longer implement it consistently. Behaviours may diminish very slowly, but careful monitoring will allow parents to observe even small changes. Finally, it is important to remember that it is not the magnitude of change that is important; it is the direction. The use of sedative medication in children with sleep problems, especially of the onset type, can be very useful in helping to bring to an end inappropriate pre-sleep behaviors, and they quite frequently shorten the time taken for sleep programs to work. Sedative-type antihistaminics such as diphenhydramine (Nytol) have the advantage that they are relatively short-acting, used in the correct dose, and are, generally, very safe. It is important to emphasize that sedative medication should only be used for short periods of time (days to weeks) and always in conjunction with a behavior program. Parents who feel that they would be unable to consistently ignore the child can try a variety of more gradual approaches although it will take longer for the undesirable behaviors to become extinct. They may choose to carry out controlled ignoring or controlled crying. This approach involves checking the child every five minutes after he or she has been put to bed. At each five-minute check, the child should be resettled if necessary with minimum interaction. The time between checks can be extended to 7, 10, 15 minutes until the child sleeps. Another approach, described by France and colleagues, that can be used with a child who is extremely resistant to being left to fall asleep without a parent present is systematic ignoring with parental presence. This method is suitable so long as the parent is prepared to sleep in the child's room for no more than seven nights. Once the bedtime routine has been completed and the parent has said goodnight, the parent gets into a second bed (a makeshift bed consisting of blankets and cushions on the floor is fine). The parent should lie still, cuddle up to a toy, and pretend to fall asleep. They should continue to keep up the act, even if the child cries and tries to get attention. Once the child has settled, the parent can get up and continue whatever they want to do for the rest of the evening. If the child wakes and cries again the parent should go back to the room, return the child to his or her own bed, as described above, and pretend to fall asleep in the makeshift bed again, getting up when the child has returned to sleep. When the parent is ready for bed, he or she should sleep in the same room as the child and pretend to carry on sleeping whenever the child wakes and cries. For the program to work, the child must be aware of the parent's presence so it is important that it is not too dark and the parents may need to emit the odd grunt or cough to remind the child that they are still there. After one week, the parent should go back to sleeping in their own room and further night-waking and settling problems should be dealt with the systematic ignoring and positive reinforcement techniques described above. Behaviours often 'get worse before they get better' and this is called the post extinction response burst. However, parents must persevere and remain consistent in their approach. Behaviours will only become extinct if the link between behavior and reward can be broken. This takes time and many repeated experiences. Children with Down syndrome generally need more practice to learn a new skill and this suggests that they make take longer than children without a learning disability to learn new bedtime and sleep behaviors. The probability of a behavior recurring becomes even more likely when it is partially reinforced (rewarded some of the time). This means that if the behavior management program is broken, i.e. a parent gives in and lets the child have 'just one more story' after the cut-off time or lets him or her sleep in their bed just once, the probability of the undesirable behavior will become even greater and the good effects will be sabotaged. In fact, the damaging effects of repeated unsuccessful attempts at systematic ignoring can be severe and long lasting. Sometimes it is possible for behaviors that had apparently become extinguished to reappear. Psychologists call this 'spontaneous recovery'. For this reason, a child who has learnt an acceptable sleep routine and whose sleep problems have been resolved, may have a period of sleep problems at some point in the future. If this does happen, a behavior management program should be reinstituted until the acceptable bedtime-behavior has been regained. Early rising is a common problem in children with Down syndrome, affecting just under one in five children (17%). In this instance, parents need to be very clear about what is an acceptable hour for the child to get out of bed or come out of their room. If the child gets up before the decided time this should be dealt with in the same way as any night-waking, i.e. returning the child to their room, with the minimum of verbal interaction, eye contact or emotional response. The child should be rewarded for 'staying in his or her own room' (note the positive use of language, as opposed 'not coming into mummy's room'). Once the child learns that disturbing other members of the family before the accepted time does not result in attention or entertainment, and that commencing the morning routine at the correct hour is rewarded, the problem should diminish. The application of principles of sleep hygiene, extinction and positive reinforcement have been effective in reducing the incidence of behavioral sleep problems in children with a range of severe learning difficulties and this has also had the effect of improving parent/child relationships and the mental state of the parents. In a study of three boys aged 5-10 years with an intellectual disability and sleep problems, parents were taught how to apply the basic behavioral principles. After the intervention, the boys, who had previously needed a parent present to fall asleep, were settling themselves independently. Sleep maintenance problems were also reduced, but not as successfully, and the quantity and quality of sleep increased. Morning waking times also became more acceptable. The improvements were still apparent three months later. The evidence was less conclusive with regard to any associated improvement in daytime behavior. However, as daytime behavioral problems are more highly associated with night waking rather than sleep onset problems, [5-6] the less effective reduction of night waking in one of the boys may have accounted for this finding. It should be remembered that this is a very small-scale study and therefore results should not be generalised. The studies outlined below have much larger samples and provide a better indication of the potential of behavior management programs to improve children's sleep patterns. A 12-16 week program led by health visitors trained in behavior management proved to be successful in decreasing the sleep problems of 60 children with severe learning disabilities. 80% of the parents suggested that there was a marked improvement in their child's sleep behavior, 16% described the improvement as moderate and 4% noted a slight improvement. The effects were long lasting as, six months after the training phase, 85% of the children had maintained desirable sleep patterns. Finally, there is evidence to suggest that successful behavioral management programs can have positive effects for parents. Mothers tended to feel less stressed and more in control. Mothers and fathers were happier about their own sleep and that of their child. Quine, L. (1997). Solving children's sleep problems: A step-by-step guide for parents. Cambridgeshire, UK:Beckett Karlson Ltd.
Ferber, R. (1985). Solve your child's sleep problems. London: Dorling Kindersley. (Available from Down Syndrome Education International). Stores, R., Stores, G., Fellows, B. and Buckley, S. (1998). Daytime behavior problems and maternal stress in children with Down syndrome, their siblings and other intellectually disabled peers. Journal of Intellectual Disability Research, 42(3), 228-237. Stores, R., Stores, G., Fellows, B. and Buckley, S. (1998). A factor analysis of sleep problems and their psychological associations in children with Down syndrome. Journal of Applied Research in Intellectual Disabilities, 11(4), 345-354. Stores, R., Stores, G. and Buckley, S. (1996). The pattern of sleep problems in children with Down syndrome and other intellectual disabilities. Journal of Applied Research in Intellectual Disabilities, 9(2), 145-158. Stores, R., Wiggs, L., and Stores, G. (2000). Management of sleep disorders in children with learning difficulties. In R. Astor and K. Jeffereys (Eds) Positive initiatives for people with learning difficulties. London: Macmillan Press. France, K.G., Henderson, J.M.T. and Hudson, S.M. (1996). Fact, Act and Tact A three stage approach to treating the sleep problems of infants and young children, Child and Adolescent Psychiatric Clinic of North America, 5(3), 581-599. Stores, R. (1996). Managing children's sleep problems, Portsmouth Down Syndrome Trust Newsletter, 6(3), 1-7. Wiggs, L. and Stores, G. (2001). Behavioural treatment for sleep problems in children with severe intellectual disabilities and daytime challenging behavior: Effect on mothers and fathers. British Journal of Health Psychology. 6(3), 257-269. Quine, L. (1997). Solving children's sleep problems; a step-by-step guide for parents. Cambridgeshire, UK: Beckett Karlson Ltd.
Turner, S. and Sloper, P. (1996). Behaviour problems among children with Down's syndrome: Prevalence, persistence and parental appraisal. Journal of Applied Research in Intellectual Disabilities, 9, 129-144. See and Learn First Counting is designed to help parents and educators teach number words, numerals and counting from 1 to 10. Designed for children with Down syndrome.